You all know how much I love food and how food for me is a vital aspect of visiting a new country. I know people who don’t really care about food when they travel (something that is completely incomprehensible to me) but I am the contrary: before I visit a new country, I research the local specialties, find out what the locals eat for breakfast, lunch and dinner, and which dishes I have to try before leaving the country. 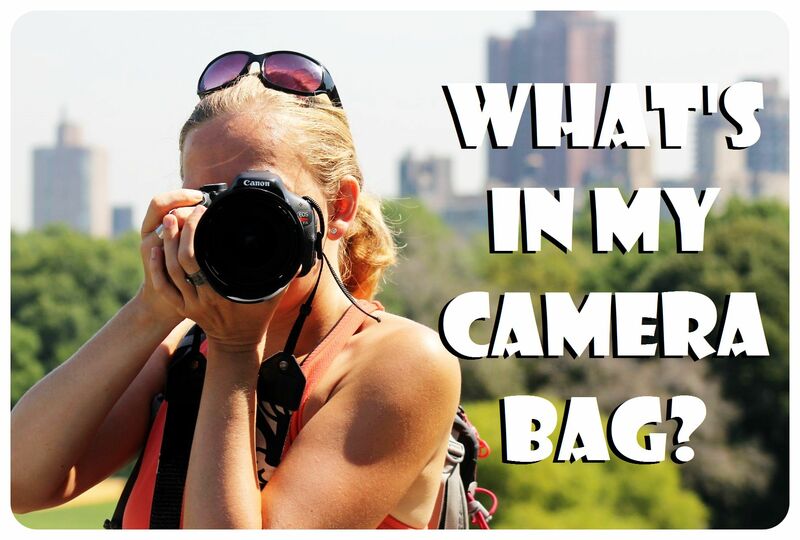 After visiting a country, I am always excited to share my foodie finds with you, telling you which dishes I loved. One country that has enough culinary delights to keep a foodie busy for weeks is Taiwan. The small island nation of the coast of China is not only known for its stunning scenery that spans from lush green mountain ranges to sandy beaches has the reputation to have one of the most delicious cuisines in Asia, and people do not only flock here to eat from China but also from Japan and the nearby Philippines. Talk to someone who’s visited Taiwan and the glorious Taiwanese food will come up for sure! Taiwanese food derived from the various cuisines in mainland China (like Cantonese or Szechuan food), but you also find Japanese influences in Taiwanese cooking. And like in most island nations, seafood plays a big role in Taiwan’s cuisine. Despite being such a small country, you can find a lot of dishes that are special to a single region. 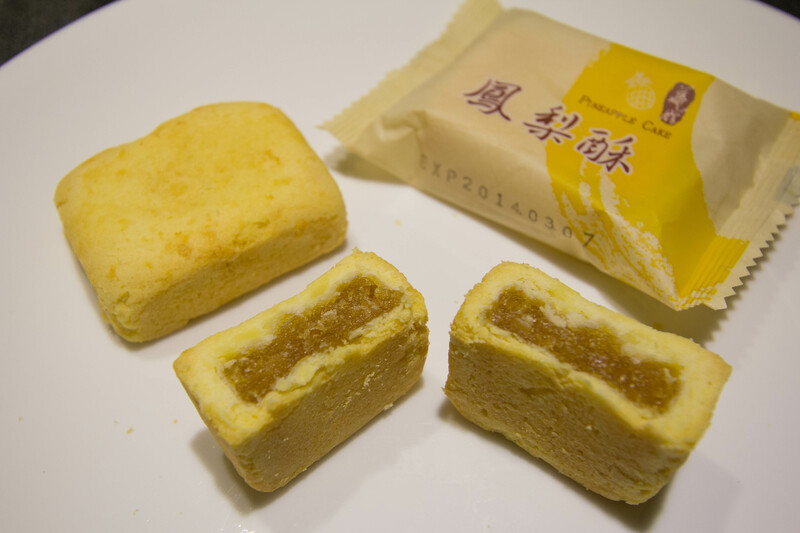 Yonghe, a suburb of Taipei, is famous for its freshly prepared soy milk, Taichung is well known for a sweet pastry named Sun Cake, Ilan is famous for a sticky rice snack called mochi while in Chiayi, you have to try the beloved cubic pastry (square cookies sprinkled with sesame seeds). Taiwanese people are so passionate about food that they will travel to another region within the country just to try their local dishes, by the way. 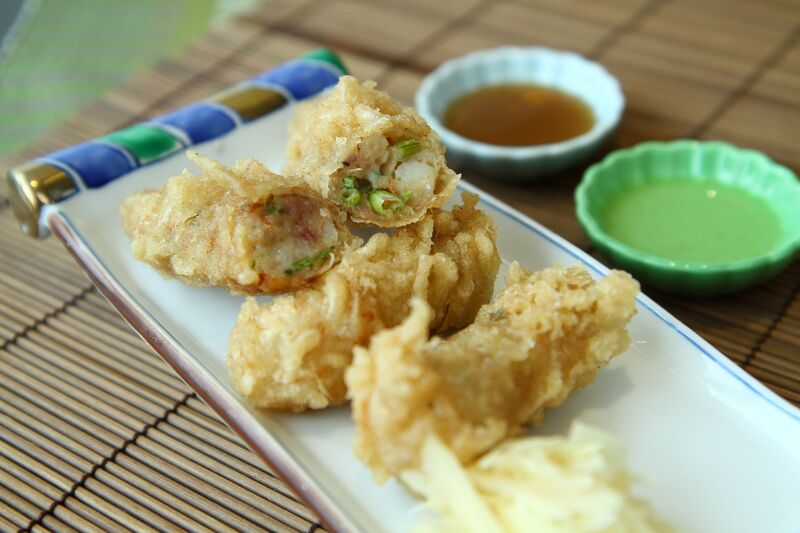 One thing Taiwan is famous for is its tradition of xiaochi, which translates to ‘small eats’. It can best be compared to the Chinese tradition of Dim sum or Spanish tapas: enjoying several small dishes throughout the day instead of the western concept of having three big meals a day. This concept is actually perfect for Taiwan visitors – it gives you more chances to sample all of Taiwan’s tasty dishes. Oyster omelet Oyster omelets are a staple in this nation of egg and seafood lovers – the omelet is spiced with a local chrysanthemum and tapioca starch is added to give it a gooey consistence, making it a distinctly Taiwanese food experience. It is usually draped in a thick, sweet red sauce. Beef noodles Beef noodles are actually a soup which is oozing with chunks of stewed beef, and served with a dash of pickles. Beef noodles are so popular that they have their own festival! Gua Bao Gua Bao is basically the Taiwanese version of a hamburger. Packed in between two halves of a steamed bun you’ll find braised pork belly, pickled cabbage and powered peanuts, all chopped up and mixed together. Fried milkfish This is one of the most popular dishes in Taiwan, and is served fried, boiled, in soup, in a congee porridge. Milkfish is so popular that it has its own museum in Taiwan, and of course a festival. Cho Dofu (Stinky Tofu) This popular snack is what is the durian for Singapore and Malaysia: you either love it or hate it, and its strong odor can be smelled from miles away (well maybe not miles, but you get the idea). Some people say the odor resembles sewage water, but Taiwanese love these deep-fried tofu cubes (that are fermented in milk) which don’t taste as bad as they smell – so best to hold your nose when you try one. 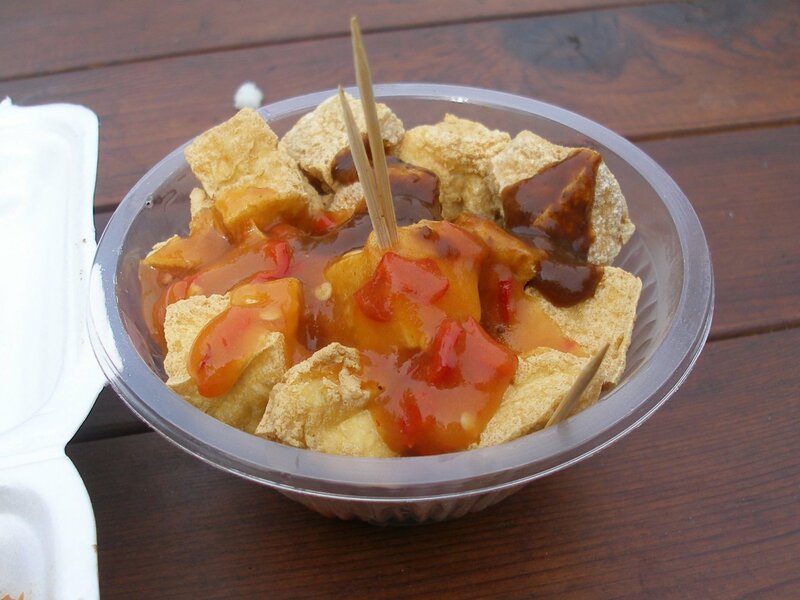 And yes, you should definitely try stinky tofu – remember that it’s popular for a reason. Coffin bread The name might not sound appealing, but trust me, once you’ve tried it, you’ll probably want to have one every single day! Coffin bread is a slice of super thick toast, prospered like a French Toast but then hollowed out in the middle and stuffed with delicious fillings that range from vegetable chowder and sea food to pepper beef. Oyster vermicelli (oya misua) Oyster vermicelli is a popular thick noodle soup (with thin vermicelli rice noodles) and as the name indicates: oysters! It’s often slurped right out of the bowl and finger-licking good. Fried pork on rice This dish might sound simple, but you’ll be amazed at the explosion of flavors in your mouth when you try the divine smelling pork belly, which is finely chopped, cooked in soy sauce with a special spice mix, and served over white rice. Green onion pancake This is something you find in every night market in Taiwan – the thin pancakes are made with scallions and usually filled with cheese and egg. Soy milk and you-tiao The most popular way to start the day in Taiwan is having the simple breakfast of a glass of savory soy milk accompanied by a you-tiao, a deep-fried dough cruller. Almost everyone in Taiwan enjoys a glass of soy milk for breakfast, but for visitors the taste takes getting used to, as vinegar is added, resulting in an interesting taste, to say the least. Pineapple cake Pineapple cake is one of the most popular desserts in Taiwan, a square short crust pie filled with pineapple. If you want to buy some to take home as a souvenir, take the SunnyHills brand, which uses local pineapples only. Bubble tea The bubble tea craze that took over the world a few years ago might be over (even though the beverage is still a popular drink in most parts of the world) but Taiwan is where it all started. 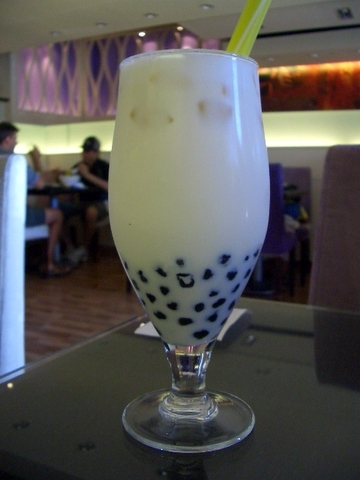 This drink, which is also known as pearl milk tea, was invented in Taiwan in the 1980s, is a milky tea to which chewy balls of tapioca are added. You can’t leave Taiwan without trying a freshly made bubble tea from a tea shop. I could go on and on – the list of yummy Taiwanese dishes is seemingly endless. 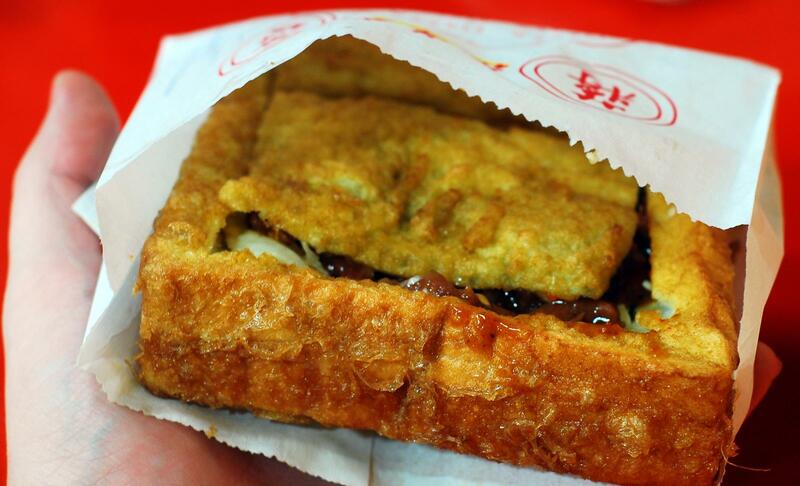 To make your mouth water even more, check out CNN’s 45 Taiwanese foods we can’t live without. If you’re lucky enough to visit Taiwan, the Shilin Night Market in Taipei is a good starting point. In addition to this popular night market which is filled with food stalls, there are about 20 streets dedicated to small eats in Taipei alone. Every city has a night market where you can sample the local specialties, but the city of Tainan in southern Taiwan is a paradise for foodie, so if you take your culinary experiences seriously, make sure to visit Tainan. Can’t make a trip to Taiwan happen anytime soon but would still love to try some of the dishes I’ve introduced you to? If you live in or around New York, you’re in luck! The ‘Savoring Taiwanese Cuisine’ Festival takes place this month in New York City! From 16 to 20 October 2015 the Taiwan Tourism Bureau and The Sheraton LaGuardia East Hotel are partnering with several award-winning chefs from Tainan who will bring you five days of savoring some of Taiwan’s most scrumptious dishes. The festival focuses on small eats and the main dish of the tasting menus you can try there will be Chou’s Shrimp Rolls, a dish so famous that it attracts foodies from all around the world! Instead of making your way to Tainan, where foodies line up to eat at Chou’s bistro (a national institution!) you can sample this world-famous dish right in New York. If you don’t happen to live in New York and aren’t able to attend the festival, look up the best Taiwanese restaurants in your city. Now you have an idea of what to try while you’re there! Have you been to Taiwan? What are your favorite Taiwanese dishes? This post is brought to you in partnership with the Taiwanese Tourism Bureau. Photo credit: (1) Beef noodles by Matthew Hine, (2) Stinky Tofu by Gary Stevens, (3) Guan Cai Ban by Michael McDonough, (4) Pineapple Cake by sstrleu, (5) Bubble Tea – All photos used under Flickr’s Creative Commons License.